BoldHeartMama: Question 1: Where did you get your blog title? Last month, to celebrate my 300th post I solicited questions from my readers. I'm finally answering one of them!! Lisa from She Ain't Heavy asked: Where did you get your blog title? ANSWER: When we first conceived the idea for the blog we spent a lot of time brainstorming blog names. At the time, I was 34+ weeks pregnant and we knew only two things: we were expecting a baby boy and his name would be Roscoe. I debated choosing a blog name that would speak to that particular moment in our lives, or one that could endure. 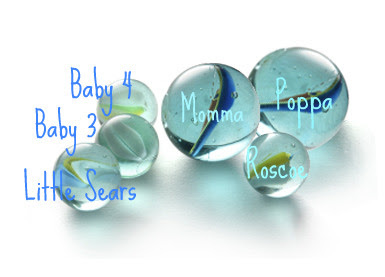 The image that kept coming to my mind was of glassy blue marbles. They embodied a simpler time, a school playground, the innocence of childhood. It made me think "boy." Still, I knew that we planned to have more kids and I didn't want the title to be relevant only to boys. I needed one that would grow with us. Then the engineer in me went straight to physics and I remembered that a force is required to change the state of motion of a given object. As expectant parents it felt as though we were on the edge of something great--a force like none we'd ever experienced was about to propel us into the unknown. Later, I wrote a post further developing the sentiment that our lives were set in motion by the birth of our first child, commencing an adventure that will only last a lifetime. See!? It's the Sears Family in-the-making! So will little Sears "Roll" on over to join the family when he/she makes an apperance? Also curious why the decision to have 4 children was there a reason for the the number 4?